Home forging What do you mean by Drop Forged? What do you mean by Drop Forged? Why do mechanical devices have "Drop Forged" stamped on them? What is Drop Forging? 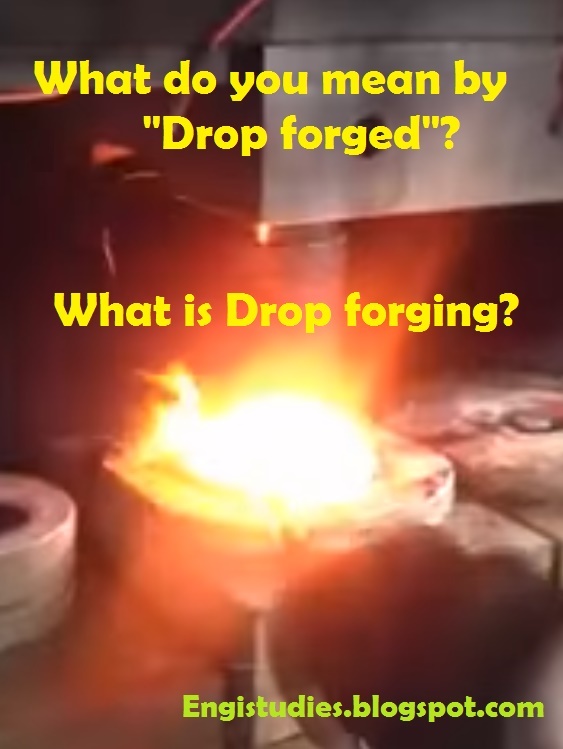 Here we will discuss and get an answer to the question 'What do you mean by Drop Forged? Drop forging is a metal shaping process used to give metal a complex shape by dropping a heavy hammer with a die on its surface onto the workpiece. In Drop Forging the energy gets transferred by the mechanical arrangements. The hammer is raised at a certain height and dropped onto the hot workpiece to deform it. This hammer is also called as 'Power' or 'Drop hammer'. The metal after the number of drops takes shape of the die. Complex shapes can be obtained using the drop forging process. The most common materials used in forging are Aluminum, Copper, Nickel, etc. Open-die drop forging: Metal is not fully enclosed. Closed-die drop forging: Metal is fully enclosed in the die. There are some of the exceptional benefits of this process. The internal grain flow of the formed piece will be continuous, making it stronger. The total cost estimated is lower than most of the other options. The produced part will have greater strength than an equivalent cast piece.